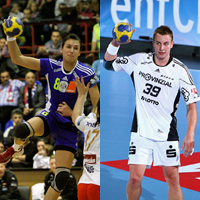 Two top players of the EHF Champions League announced World Handball Players of the Year 2010. At the occasion of the opening press conference of the 22nd Men’s World Handball Championship in Sweden, the International Handball Federation announced the new World Handball Players of the Year. For the first time the voting was carried out by three parts. In addition to an online voting for fans, a jury of experts and coaches as well as a jury of international media representatives were given the possibility to cast a vote. Five female and five male players were nominated, all ten are first-rate players in the EHF Champions League. In last season of the major European league, four of the female players and two male players even reached the final. The winners are Cristina Georgina Neagu (ROU, C.S. "Oltchim" Rm. Valcea) and Filip Jicha (CZE, THW Kiel). It is the first time for players from both Romania and the Czech Republic to receive this title. In 2010 Neagu was top scorer of the Women's EHF EURO 2010 in Denmark and Norway with 53 goals, and came ninth in the EHF Champions League top scorer ranking with 65 goals. With her club Oltchim Valcea the left back reached the final of the EHF Champions League, but endedn ranked second. In 2010 Jicha won the EHF Champions League with THW Kiel after an exciting EHF FINAL4. He was also top scorer of the league with 119 goals. At the EHF EURO 2010 in Austria he was also top scorer with 53 goals, despite his team only reached the Main Round. Neagu and Jicha will receive the awards in Malmö (SWE) at the final weekend (28-30 January 2011) of the 22nd Men’s World Handball Championship.